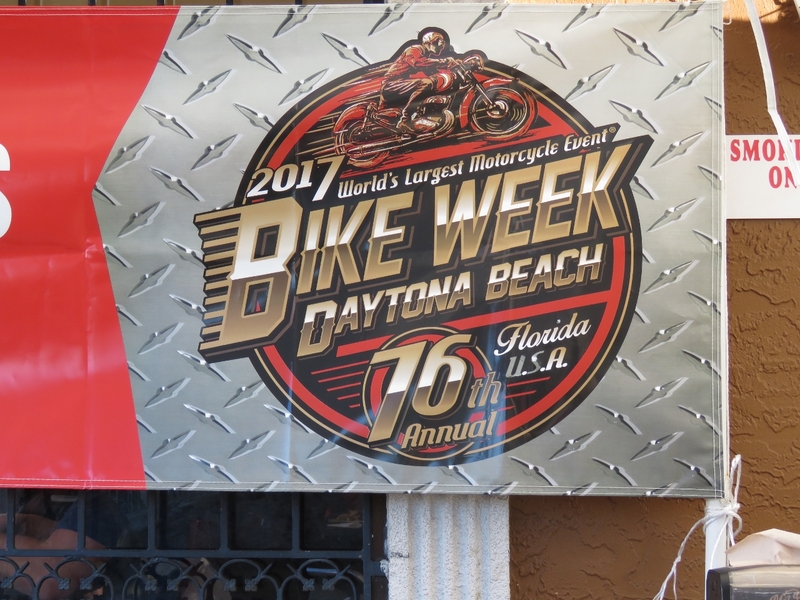 Barely have the Daytona 500 crowds dissipated when Daytona Beach hosts the 76th annual Bike Week. 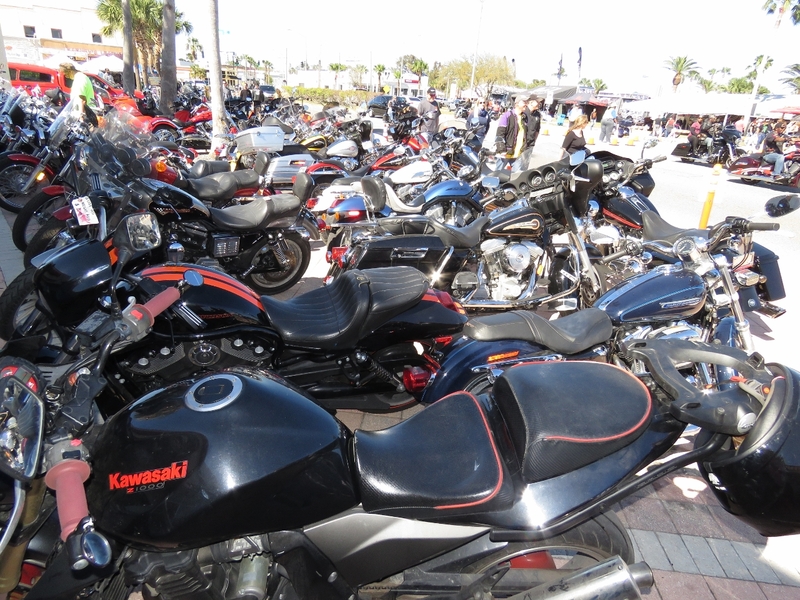 The 10-day motorcycle event originated in 1937 and draws an estimated 500,000 people. From the marina we’d been hearing motorcycles pass all week, and after a morning of running errands with a rental car, we spent the rest of the day at Bike Week. 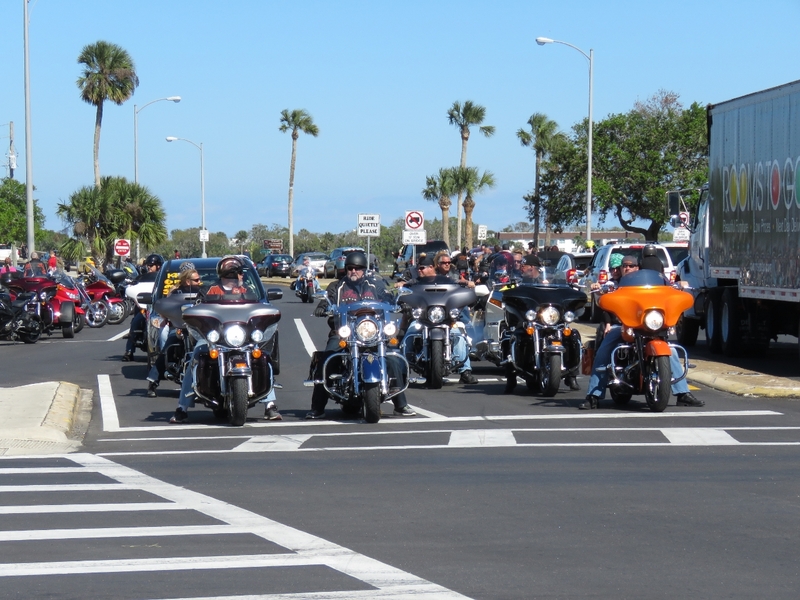 This was pretty much the view all day on every road we drove on: dozens and dozens of motorcycles. If you want to buy something motorcycle-related, this is the place to be. Vendors selling everything from leather doggie vests to highly-custom bikes pack the streets. 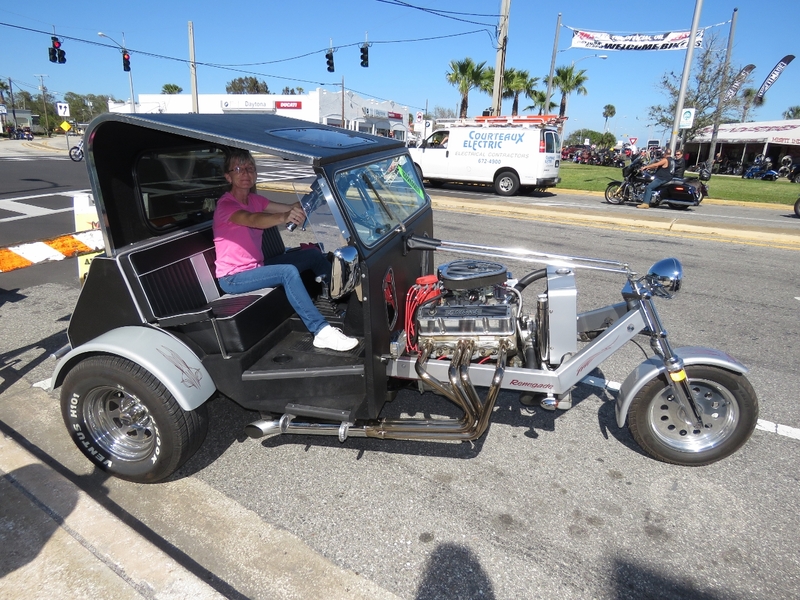 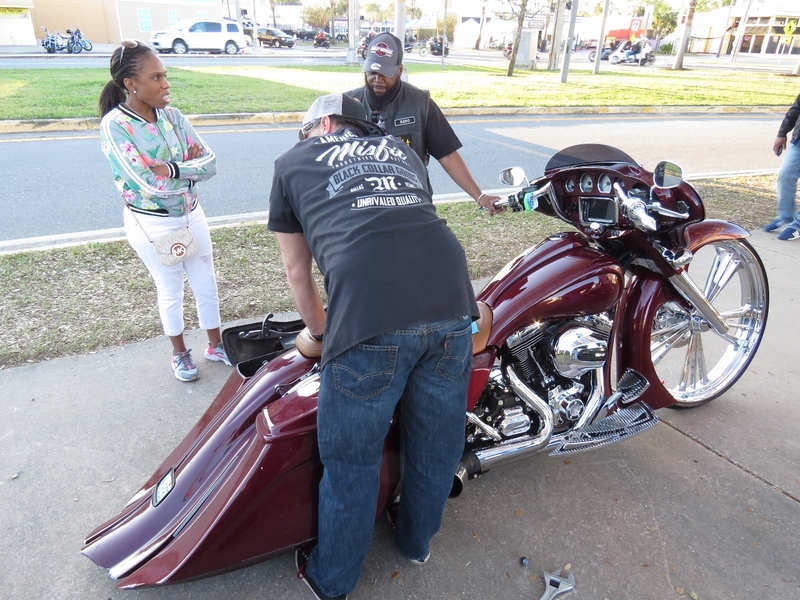 Here Jennifer is checking out a Renegade Trikes custom hardtop trike. It’s powered by an automative V8, automatic transmission and automotive rear-axle. 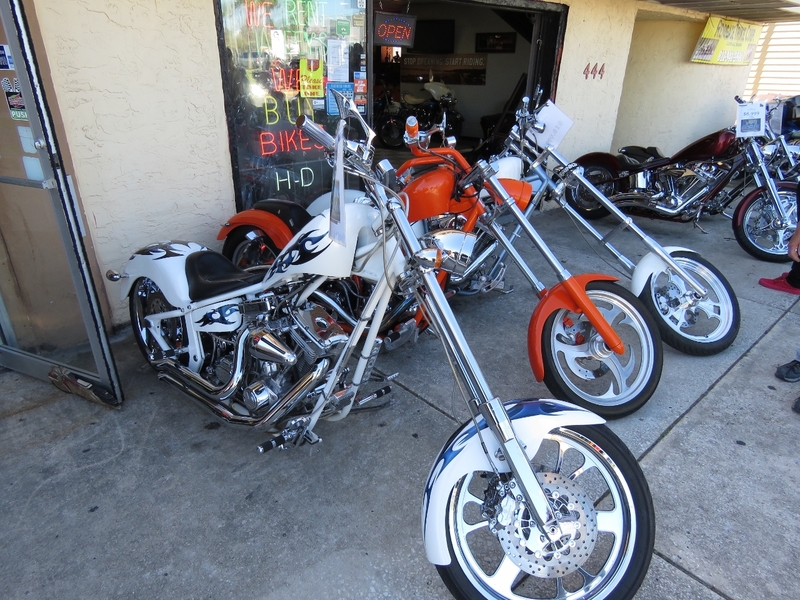 Beautiful paint jobs and lots of chrome on these these choppers. A field of Kawasakis for sale. Harley Davidsons were the dominant bike, but pretty much every other manufacturer was represented. The streets were jammed with parked motorcycles. 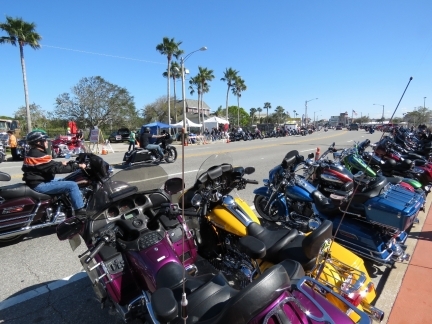 The city had put out signs down much of Beach Street restricting parking to motorcycles only. Custom everything on this chopper, from the paint job to the design, but still with Harley Davidson power at the core. 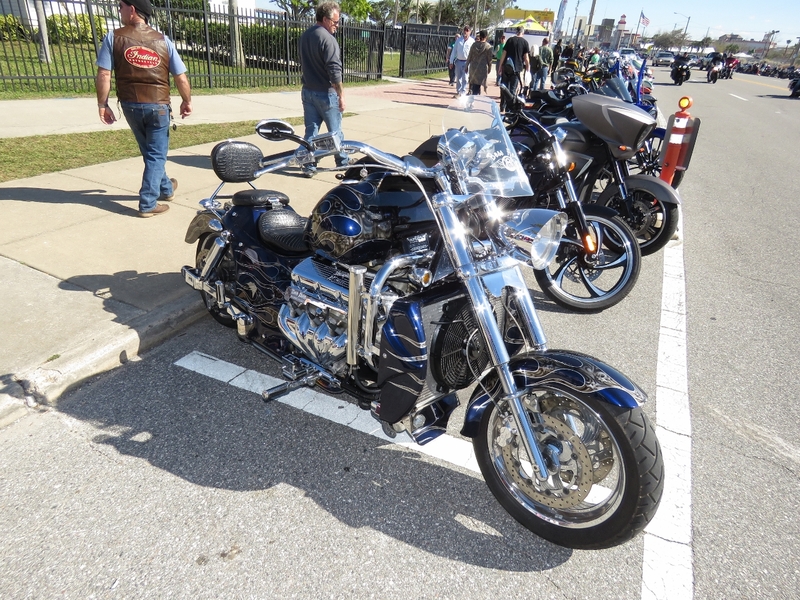 We were amazed to see a few “regular” motorcycles with V8 engines. This is a Boss Hoss, the only globally-approved V8 motorcycle manufacturer. 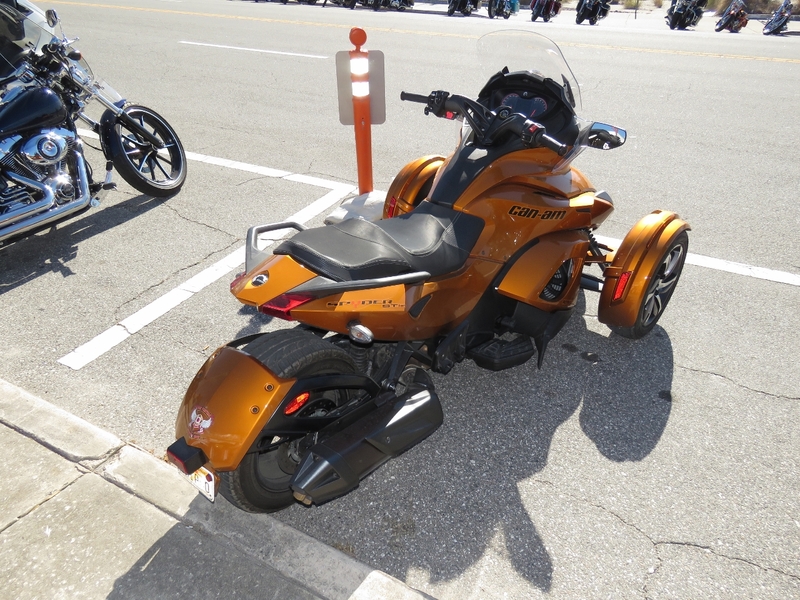 Motor trikes are very popular, both with single front wheel and single rear wheel designs. 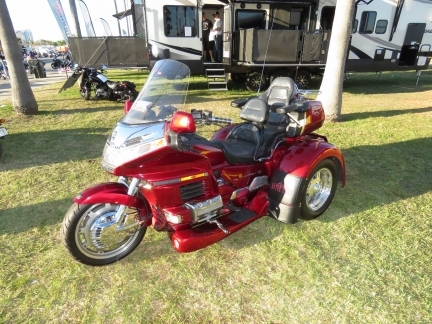 The stable platform and extra space likely appeal to the aging biker population. The Ford F650 is a beast. 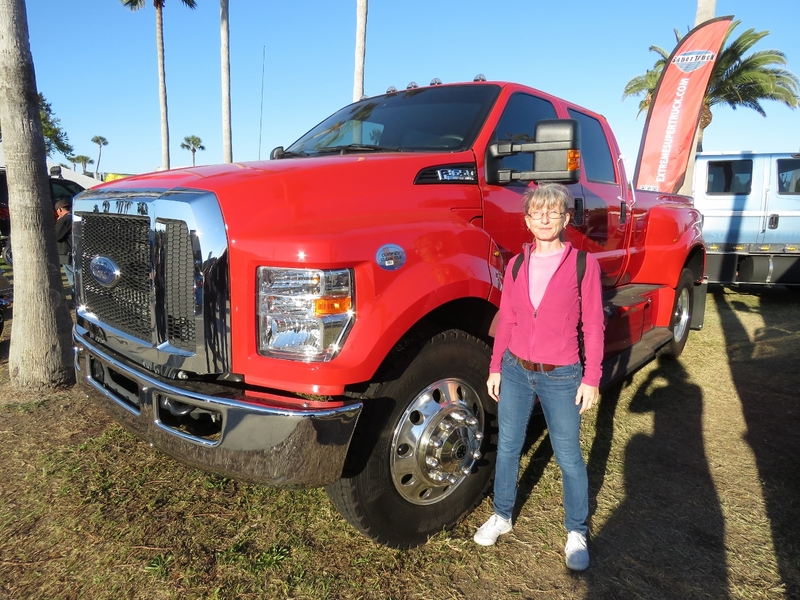 It’s about as big as you can get on a pickup chassis. Motor Trike makes trike conversion kits for the most popular brands. 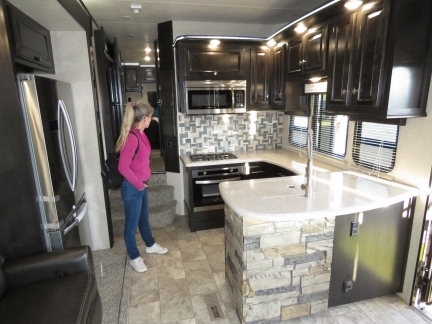 Optimum RV had a number of toy haulers on display. We were impressed with the layout and quality of this Forest River model with a large galley, slide-out seating area, and two fold-down decks. The area behind the photo had space for two large motorcycles and converts to a deck and seating area when not in use. 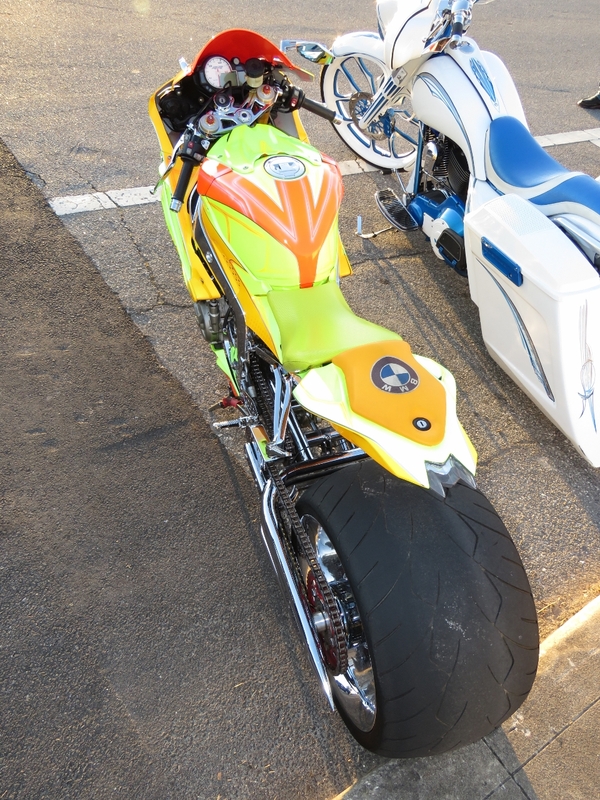 We loved the slogan for Misfit Industries: “Black Collar Goods”. They do incredible bike customizations. 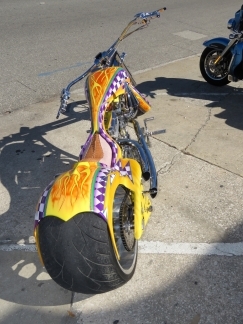 This trike is an incredible work of art, by far the top of the trikes we saw. 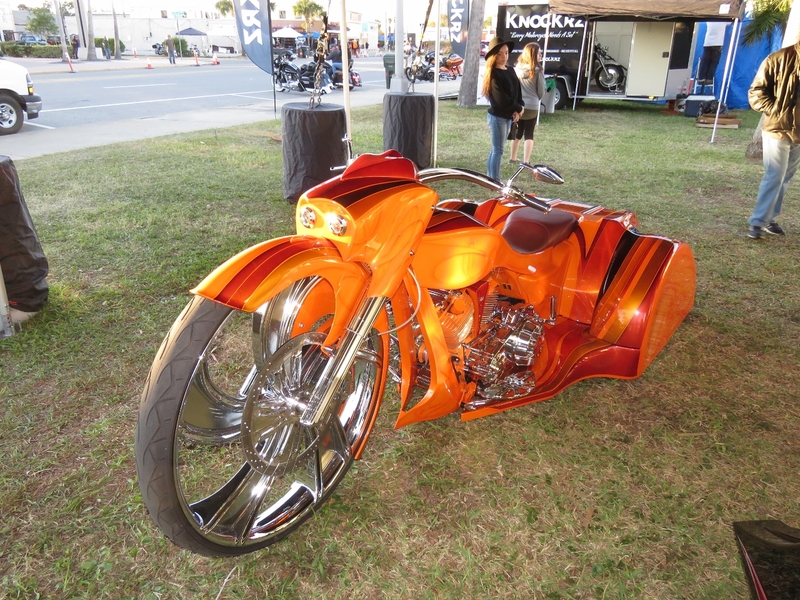 Most of the heavily-customized bikes were Harley Davidson-powered, but this one sports a BMW engine. 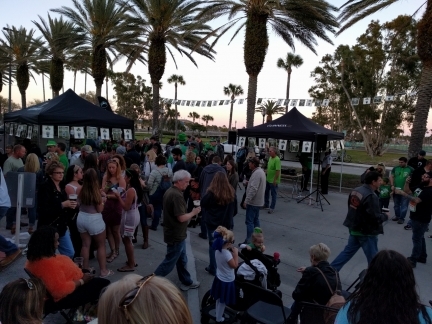 The St. Patrick’s Day celebration was in full swing at McKs Irish Tavern that evening.